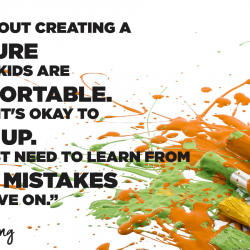 Mistakes are a part of artmaking, but it can be difficult to explain that idea to our students–especially our kids who want everything to be perfect. It is important to help kids find the joy in art and teach kids to learn from their mistakes. In this episode, Cassie shares some ideas for doing so. She discusses how to talk about growth mindset with your students, drawing exercises and activities that guide students toward success, and why you need to demonstrate a few mistakes and show what to do with them. Full episode transcript below. Cassie: Do you all remember the time when art making went from something that was like super fun, your favorite thing to do when you were a kid, just absolutely loved, everything about it was fabulous from the supplies, to whatever it was you made was amazing? Then suddenly, one day, that all went away and everything that you drew looked terrible. Every little line that you made on your paper wasn’t right. You spent more time erasing then you did a drawing. It just got to the point where art making became so frustrating for you because what was in your mind, you couldn’t seem to make it happen on paper. Your skill level, maybe, just hadn’t caught up with where you wanted it to be. If that sounds familiar to you as an artist, like it does for me, then imagine how it is for some of our students. We’ve got them, those perfectionists. I usually see it happen in my students when they hit about third, definitely fourth, grade. And I see the shift where art becomes, I hate to say a task, but they put so much pressure on themselves. And they get so stressed out about it not looking just right, or they have negative self-doubt talk. As a teacher, it’s like heartbreaking. You remember what joy they had. How carefree they were in kindergarten, only to see all of that go away, for some of them, when they get older. What do we do about that? 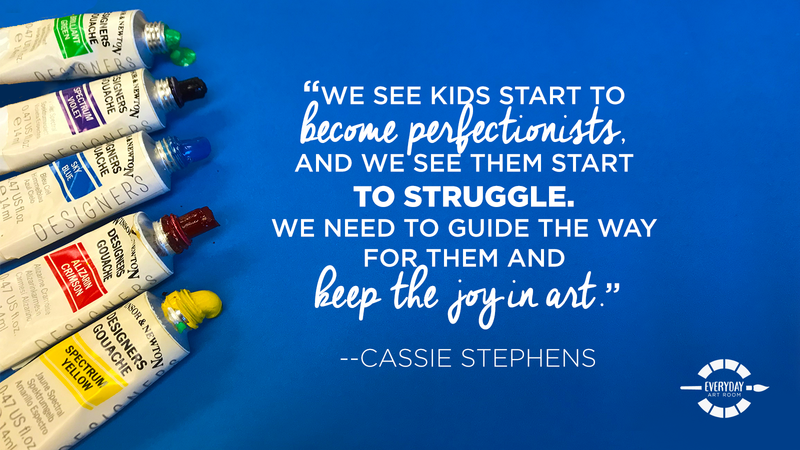 What do we do about our perfectionists and get them to take a breath, lighten up, love the process all over again, and be a little bit less hard on themselves? Let’s talk about it. I’m Cassie Stephens, and this is Everyday Art Room. One thing I feel like, I know I don’t do this often enough, and so since I don’t do it, I’m just going to assume that you’re just like me. I feel like I don’t tell my students enough stories about me, as an artist, and about how I was when I was their age. I think that I need to start doing that more and, if you do, don’t do that. If you’re like me, you might want to consider doing it too, because I remember when I was a kid and I would see adults. I would just always assumed that the adult was the same person that they had always been. Meaning, they’d always been an adult. They’d always known how to do all these amazing math problems or read really well. You never heard, at least I never did, about a teacher, or an adult, struggle with learning, with math, with reading. I think, for me, that would have really helped me out, as a kid who really struggled with reading. It would have been nice to know, “Hey, I was there just like you. You’re going to pull through this. You’re going to make it. You’re going to learn how to read,” or whatever it is that they’re trying to do. When we’re teaching our students, especially those dreaded, at least for me, things such as teaching how to draw portraits or, heaven forbid if I’m ever feeling feisty enough to teach perspective. Those things are not easy to teach and it’s also not easy to learn. When we, as teachers, get frustrated because kids aren’t getting it. They pick up on that. All of our students are these amazing little mirrors that reflect us. I think sharing with them a little bit of our journey, as an artist, as a learner, really helps. When you do have those perfectionist kids in your room, I think that it’s super important, of course, to always kick off the school year with a little chat about growth and fixed mindsets. Now, I say kickoff the year, and here we are a good 60, what 50, days into the school year. Let me just retract that statement. It is never too late, too early, too whatever, to talk to the kids about growth mindsets. If you’re not familiar, in short, all it is is when you’re learning something there’s always going to be a learning curve. It’s a lot easier to learn something when you keep an open mind and you know that, along the way of learning something new, you’re going to make mistakes. And, instead of getting frustrated, with those mistakes and deciding that you can’t learn, because you’ve “messed up,” but to use those mistakes as a learning tool, as a stepping stone, on your way to learning how to do something is a magical way to get you to your end goal. There are so many resources out there to chat with your students about growth mindsets. In fact, there’s a really great book that’s called, The Growth Mindset Coach. Me, personally, my favorite way to talk to the kids about the growth mindsets, without getting too wordy, and explaining it too much, of beating them over the head with it, is to use kid’s books. I think the very first book, that a lot of us have already read to our students, but it’s worth revisiting, especially when you’re seeing your students struggle with perfectionism is Peter H. Reynolds’ book, The Dot. I know many of you are familiar with this book. But if you’re not, it’s about a young artist, her name is Vashti. She’s frustrated because she doesn’t think that she can paint. She doesn’t think that she can create art. Her teacher gently encourages her just to try, just try. And she does, and she’s thrilled with the results. She’s trying so much, she just can’t stop creating. In the end, her enthusiasm for creating rubs off on another young artist. She, in turn, gives him that gift of just go for it, just create. I think that if you notice your students are on that perfectionist mindset, and they just think that they can’t do art, they can’t create, it’s great to revisit that book, even with older kids. It’s a short book. Kids of all ages, I don’t care what they say, love picture books. To talk about Vashti’s mindset, in that book, and how it changed from a fixed mindset of how she thought she couldn’t do something, to a growth mindset, where she was learning from every painting that she created, could really be eyeopening for kids. I also think that to discuss that, have you ever felt this way? Have you ever felt like you just couldn’t do something? And, maybe, make it applicable, not just to art, but to so many things. I mean, I always feel like when we’re in the art room, “teaching art,” teaching art, as we do. There are so many lessons there and, most importantly, life lessons. A lot of our students aren’t going to grow up to become artists and that’s perfectly fine. But along that journey of teaching them, what I find to be most important, for me to instill in them, is a love of creating, a love for themselves, and just a love of exploring, and being okay to make those mistakes, and to embrace them. Reading something, like The Dot, I feel like can really help with that. I love following The Dot with Barney Saltzberg’s book, Beautiful Oops! That book is amazing because it’s one thing to say, “Hey, if you make a mistake, just keep going with it.” But his book actually shows you all the things that you can do with a “mistake,” or an oops, and it offers so many amazing solutions. Those are two books that I feel like can really encourage those perfectionists to just take a deep breath, let it go, and be free in exploring the mistakes that they might make, “mistakes.” Now, these are the ideal ways to approach perfectionists, but let’s talk nitty-gritty. All right, so you’ve read them the books, but let’s be honest, when they get to their seats, it’s still a struggle for them. You have to put yourself in their shoes, because you’ve been there, as an artist. You know what it’s like to want to be able to create something and just not quite be able to yet. Okay, soapbox, stepping down. But because drawing tends to be that thing that frustrates students quite a bit, I love to offer dry erase boards to my kids. I have noticed all of my students absolutely love drawing on dry erase boards. In my art class, with 30 minutes, I don’t often have a lot of time to say, “Hey, grab your sketchbook or get a piece of sketchbook paper and draw out your idea.” We just don’t have time to do that, and when you are having them drawing on a piece of paper, a lot of those perfectionists will spend so much time erasing. If you give them a dry erase board, there’s just something great about drawing on that really slick surface with a marker. It’s so forgiving and I notice that my students really loosen up quite a bit when they do it. If you have a kid who is struggling with drawing something, offer them a dry erase board and let them have at it. Then when they are done creating their drawing, if it’s a drawing on their dry erase board that they’re really happy with, why not let them trace that drawing? For example, right now my second graders are working on drawing superhero selfies, so they’re drawing themselves as a superhero. To warm up, they’re drawing on dry erase boards. A lot of them have expressed how much they love their dry erase board drawing, but they’re struggling to make that same image appear on their paper. I have no problem letting a student trace their own drawing. That might be another solution that you might consider. I also, in my room, when my students are drawing, if we’re doing, like let’s say a guided drawing, or even, for example, my fourth graders, they are currently working on self-portraits. I, a lot of times, will call drawings a practice drawing, “Think of this as a practice drawing.” As soon as you say, “Practice drawing or this is just a sketch,” they immediately lighten up a little bit. But if you suddenly give them that really nice piece of paper and you tell them, “Okay, this is it. The rubber is hitting the road. You can’t mess this one up, because you’re only getting one piece.” Imagine the amount of stress that’s putting on a kid, who already is stressed enough as it is. My fourth graders, right now, are making self-portraits. That’s one thing that is difficult for older kids, I’ve noticed, because, as I said, they want things to look realistic, but portrait drawing is not easy, especially if you’re nine or eight. Having a skill set that’s not caught up with what they have in mind can be frustrating for them, as you could imagine. Right now, to lighten the mood a little bit in my room, so to speak, my fourth graders are using bingo daubers. You all have heard me talk about them endlessly before. It’s, basically, like a thick marker that is filled with India ink. They’re drawing their self-portraits on nine by 12 pieces of paper. Already, they have a small paper with a marker that draws a large line. I like that because it makes it so they don’t get caught up in the details. It makes it so they can’t draw teeny-tiny. Have you noticed that the older they get, the smaller they draw? Yeah, it’s part of that perfectionist mentality. The reason I do this is because, and you guys have seen this, they’ll draw one line and they’re like, “I messed that up.” They’ll crumble the paper, throw it away. They’ll draw another line on another piece, “I messed that up.” They’ll crumble it and throw it away. I’ve seen it happen. It’s a waste of paper. It just frustrates them and it doesn’t teach them how to work through their mistakes. With these self-portrait drawings, they have, with those markers, which they can’t erase, they have to finish it, even if it’s not their most favorite. Then whatever they do on their second or third paper, that they need to make sure to try to learn from their things that didn’t make them as happy. We try to avoid the word, mistake. Things that didn’t make them as happy in their previous drawing. How do you think the kids are going to react when they have a drawing that they didn’t like last time and they still have to plug away and work through it? My students, knowing my friends, they would go into disaster mood. While this already looks like something I don’t like, so I’m just going to not care about it any further. If I’m going to add color to it, I’m going to scribble a color. If I’m going to paint it, I’m going to do a sloppy job because I don’t like it anyway. I get it. I mean, if I were working on something that I wasn’t happy with, and I was still stuck with that same work of art, and not given the opportunity to move on from that, but have to plug away through something that I was frustrated with. I know what you’re thinking, “Well, isn’t that a way for them to learn?” It is, but I never want my art room to be a room of frustration. I want them to, like I said, enjoy the process of creating. For me, this was my solution for self-portraits for fourth grade. That was a long-winded way to say, call their drawings practice drawings and let them work from there. I also, when I’m demonstrating, for example, when I was demonstrating these self-portraits with a permanent marker to my fourth graders. I love to demonstrate oopsies. I love to demonstrate making a mistake. I will start by using my paint marker, or whatever art supply I’m using. I’ll be following directions along, making a masterpiece that, you know, is what we’re going for, whatever I’m thinking of, or whatevers. All of a sudden, I will just take my paintbrush and make a big line across my work of art, or I’ll completely “mess up” my self-portrait by drawing a big slash across the face or making an eye that looks a little bit wonky, or a nose that’s too long. And it’s hilarious, because the kids will all go, “Ahhh,” like a collective like, “Oh my gosh.” Then we talk about it. “No, I just drew something and I can’t stand it. What should I do? I can’t throw this away. I can’t crumble it, that’s breaking the rule. The one rule, which is I started it, so I have to finish it to completion. What should I do?” Starting a conversation with the kids about, “Well, you could turn that line into your chin, or could you draw another line there?” Even letting the kids get up and, maybe, painting on your paper to demonstrate some solutions, is a really great thing. It’s so funny, because once I show them a couple of solutions to that, they’re like, “You can’t even see the mistake. It looks really good.” I remember, as a kid, watching Bob Ross. He would start to do something on his canvas, and I was like, “No, Bob. You messed it up completely.” Magically, it would turn out perfect. Even, maybe, showing them clips of artists working through what we might perceive as being a mistake and, yet, it turns into something amazing, is pretty incredible to see. Storytime you all. I remember, in second grade, we had these plates. We were given these, like a thick plastic plate, and we were to use a very special set of markers on these plates and draw a winter, Christmas time, scene. When we were done drawing them, our teacher was going to send the plates away to a special company. They were going to, I don’t know, cure, or somehow bake, the marker on. I don’t remember the fuzzy details, at all. All I remember was, is that I took a lot of pride in my artwork, in second grade. I fancied myself quite the artist. I think showing kids those oopsies and making one on your art, is a really great way to show them how to work through mistakes. You know what? I’m like, right now, with my fourth graders, knowing my people this year. They are such perfectionists and they are so hard on themselves, that I have decided to make my projects a lot looser with them, make them a lot more free. They are very active. They’re an active bunch of kids. They’re a chatty bunch of kids and, instead of trying to just contain and rein that in, I’m not going to fight a battle I’m going to lose. I’m going to go with it. If you have those perfectionists, maybe they need to be loosened up and lightened up, because there’s so much more to art than just drawing. There’s so much more to art than realism and they need to know that. They need to know that simply because you can’t draw as good as so-and-so, that’s only one small aspect of art. Let’s find all the amazing things that you are good at. Show them that big beautiful world of art, filled with all the messes, and filled with so many mistakes, and all the things that you can learn from them. Tim: Hello, this is Tim Bogatz from Art Ed Radio. 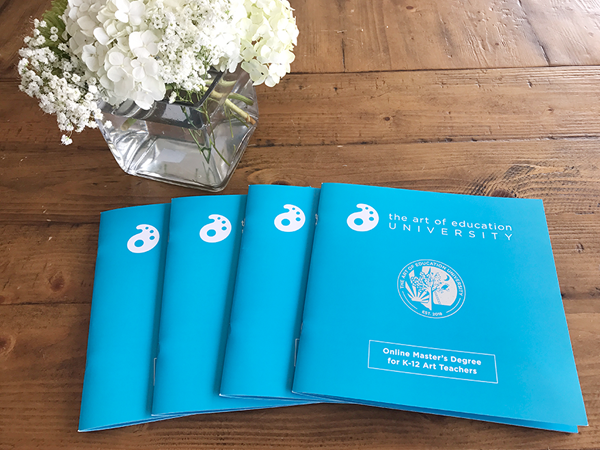 I want to talk to you today about Art Ed PRO. There are now over 80 Learning Packs that we have developed and the library includes on-demand professional development with video tutorials, downloadable handouts, and all kinds of other resources to help take your teaching to the next level. There are three new Learning Packs released each month. Make sure you check it out at theartofed.com/pro. There is also an article up on the AOE website that has some suggestions on how to get your administrator to pay for a PRO subscription for you. Once you’re done listening, go see what’s there. Right now, let’s bring back Cassie and let her finish up the show. Cassie: Well, my goodness, I talked so much I barely get to have time for the mailbag, but I had … Last week, on the podcast, I was sharing with you how you need to just speak up for yourself, because ain’t nobody else going to do it for you, so you might as well do it. I was sharing that on Instagram. I got a really incredible message/question. It’s long-winded and so is my response, so I’m going to share it with you. This is my fifth year of teaching and I’ve had more administrators in these five years than I have had teaching. We got a new principal last year, and this year, and she is really laying down the law. Micromanaging us minute-by-minute of what we should be doing. Our district is shoving curriculum down our throats and it is an expectation to be doing that curriculum every day no matter what. If we are not doing what our schedule says we’re supposed to be doing, then shame on us. She even said, “No matter if the kids are enjoying the lesson, we have to move onto the next thing, no excuses.” We can no longer, as a school, watch dress rehearsals for programs because it “cuts into instructional time.” This principle is purposefully pushing teachers out by honing in on certain things that she thinks that they’re not doing. While I’m not one of those, I’m constantly paranoid, now, that I’m doing something wrong. Not to mention, I cannot get ahead of my workload this year. I’m also 27 weeks pregnant and I’m on the brink of a mental breakdown. Who can blame her? This sounds terrible. Thankfully, we have Thanksgiving break next week. I’m wanting to leave the school and, possibly, the district. But, for now, I don’t know what else to do for myself to make it through to the rest of the year. Every week the teachers are being told to change something, or no longer do something, and it’s extremely debilitating. What else can I do, other than trying to make it through every single day, because I’m drowning? This makes me so … This frustrates me so much. I know that her administration is, I’m sure, getting it from her superiors, or his superiors, also. But this is what is driving teachers away from teaching. This is what makes schools not fun for students. I just think that when the administration does stuff, like this, it is so shortsighted. They’re just thinking of the numbers. They’re not thinking of the people. The people, like the faculty and staff, and the kids, the small people, the most important people. My advice, when it comes to teachers, like this, because I know when I was reading that, I bet several, not even several, many of you, were nodding in agreement. One of my reasons for sharing that with you is so that you know that you’re not alone. That so many of us are in this kind of situation, that just plain old stinks. You know, a couple of weeks ago, I talked about trying to decide should you stay or should you go? The thing is, is that no matter where you end up, you could end up with an administrator, in a year’s time, or couple year’s time, just like that, or in a situation just like that. What do you do? My thing, that I have done, is to, if possible, it doesn’t necessarily sound possible in this situation, is to not take any of this stuff so seriously. I know that administration might be taking it seriously, obviously, they’re getting it from somewhere. But having taught, as long as I have for 20 years, having seen every trend come and go, and let me just tell you, the trends, they are basically repackaged with a different name and led to believe that, if you don’t teach this way then you’re doing a huge disservice to your kids. You know your students. You know what’s best for your students if you’re paying attention. You know what they’re responding to and you know what works. This too shall pass. These administrators, hopefully, they too … I was going to say they too will pass, but that makes it sound like I want them to pass away. I don’t. I just want them to, maybe, go away. I have ridden out my share of administrators, like this, and I’m happy to say that, now, I’m in a situation where my administrators trust me, and they trust what I’m doing with our students. I mean, I honestly have no words, other than, stick to your guns, stick to your room, stick to doing what you know is best, because you are the boss of art teach room applesauce. You know what? When I go home this Christmas, I think I’m going to have to ask mom if I can have that plate. I remember, every year, when she would bring that plate out, I would see that dad-gum line and get so frustrated. I think it’s high time that I fix it. You know what? I just got an idea. Wonder if I should photocopy that plate and make it into a little Cassie’s oops or Miss Stephens’ oops worksheet for my students? Let them offer up solutions for what I can do, or should have done, to fix that plate. Sharing our mistakes with our students, lets them know that we’re human. Lets them know that we weren’t just born with these skills and amazing creative abilities. That we learn them just like they’re learning them. It’s important for all of them to know that especially our little perfectionists’ friends out there.